Joseph Teeter appeared on Show 289, recorded in Seattle, WA, in April 2014. 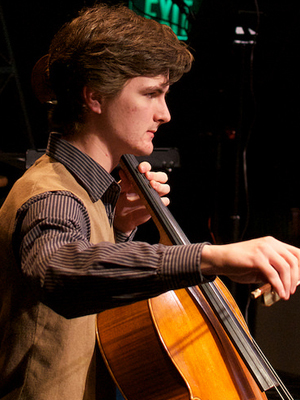 Joseph Teeter (cello), 17, is from Topeka, Kansas and attends Topeka High School. He studies with Lawrence Figg of the Kansas City Symphony. Joseph is principal cellist of the Kansas City Youth Symphony and a member of the Topeka Symphony Orchestra. He has attended the Aspen Music Festival and the Sunflower Music Festival Institute. Joseph was the winner of the Kansas City Youth Symphony Concerto Competition in 2010, the Topeka Youth Talent Audition in 2012, and the Nebraska Spring Strings Festival Concerto Competition in 2012. He participated in the International Tchaikovsky Competition for Young Musicians in Switzerland in 2012. In addition to cello, Joseph is a ballet dancer and sings in an a cappella school group. He also enjoys basketball, reading, going to baseball games, and volunteering.